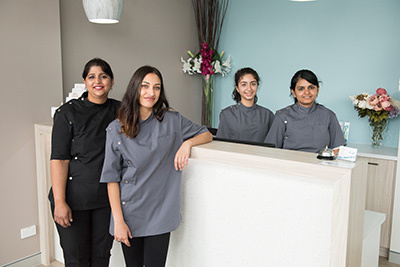 Rouse Hill Smiles is a family-friendly dental practice located in the heart of Rouse Hill in Sydney. Our modern and spacious facility has been operating since 2017, serving as Dr Teena’s first practice. She has a wealth of dental knowledge and experience, having been operating within the industry for over a decade. Dr Teena and the Rouse Hill Smiles team are dedicated to providing patients of all ages with the highest quality of care. From children to seniors and everyone else in-between; you’re sure to benefit from our affordable and wide range of general, cosmetic, and restorative dental services. Rouse Hill Smiles provides quality dental care for every stage of your life. From wisdom teeth extractions, to teaching your child how to maintain their oral health, or even providing dentures – you’ll find all of these services and more here. We strive to serve as your all-in-one Rouse Hill dentist, and enjoy building long-term relationships built on trust with each of our patients. We also pride ourselves on catering to all of your family’s dental needs. Thanks to our state-of-the-art dental technology and in-house facilities, Dr Teena is able to perform a wider range of dental services, right here in our practice. This prevents the need for unnecessary referrals, saving you and your family both time and money. At Rouse Hill Smiles, we put our patients’ oral health first, every time. This means you can rest easy knowing that we only utilise the safest and most-trusted materials and methods in our dental treatments. Our technologically-advanced, on-site equipment (such as 3D scanners) allow us to gain a more comprehensive view of your mouth. We also maintain high hygiene standards and sterilization methods.